At least six people have been killed in a spate of violence in south Thailand. Two government workers were among the latest victims to be killed in drive-by shootings across the region. Thailand's new premier, Surayud Chulanont, is travelling to Kuala Lumpur on Wednesday for talks with his Malaysian counterpart Abdullah Badawi. The continuing insurgency in southern Thailand - which has claimed more than 1,500 lives since January 2004 - is expected to dominate the discussions. Officials blame Muslim rebels for much of the unrest, although criminal gangs are also thought to be behind some of the attacks. Thailand's new military rulers, who took over the country in a coup last month, said they wanted to hold talks with the insurgents - a policy change from the previous regime, which repeatedly refused negotiations. The spate of killings began on Monday morning, when two rubber tappers in Yala were shot by the roadside. 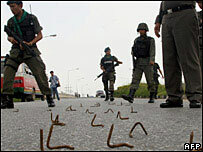 Despite a heavy Thai security presence, attacks such as drive-by shootings or small bombings take place almost daily.